The book presents the future developments and innovations in the developing field of microelectronics. The book’s chapters contain contributions from various authors, all of whom are leading industry professionals affiliated either with top universities, major semiconductor companies, or government laboratories, discussing the evolution of their profession. A wide range of microelectronic-related fields are examined, including solid-state electronics, material science, optoelectronics, bioelectronics, and renewable energies. The topics covered range from fundamental physical principles, materials and device technologies, and major new market opportunities. 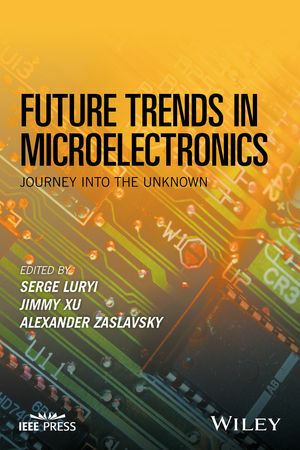 Future Trends in Microelectronics: Journey into the Unknown is written for industry professionals and graduate students in engineering, physics, and nanotechnology. Serge Luryi, PhD, is a Distinguished Professor and Chair of Electrical and Computer Engineering at Stony Brook University, as well as the Director of New York State Center for Advanced Technology in Sensor Systems. He has worked in microelectronics for over 30 years, published over 250 papers and has been awarded 53 US patents. He is a Fellow of the IEEE, of the American Physical Society, and of the Optical Society of America. Jimmy Xu, PhD, is the Charles C. Tillinghast Jr. '32 University Professor of Engineering and Physics at Brown University. Prior to 1999, he was the James Ham Chair of Optoelectronics, as well as the Director of the Nortel Institute for Telecommunications at the University of Toronto. He has worked in microelectronics for over 30 years. He is a Fellow of the AAAS, APS, Guggenheim Foundation, IEEE, and the Institute of Physics. Alex Zaslavsky, PhD, is a Professor of Engineering and Physics at Brown University. During 2009-2012 he was a Visiting Senior Chair of Excellence at the Nanosciences Foundation in Grenoble, France. He has worked in microelectronics for over 25 years and has published over 130 journal papers and book chapters. He has been an editor of the Solid State Electronics international journal since 2003.